While my parents were visiting we had a favourite “pud” of ours… apple strudel, which I have already posted here. But a couple of weeks ago the freezer was due for its annual defrosting, and I was pleased to find there were still quite a few plums and some rhubarb (and far too many blueberries!). Hence this delicious pud. The first one with plums and blueberries was so good that a few days later I made another one, with the last bag of rhubarb and some blueberries…. Preheat the oven to 180°C/350°F. Butter a flan dish and lay the fruit in the dish. Sprinkle with a little vanilla or cinnamon sugar. In a large bowl, beat the eggs for one minute. Sift in the flour and sugar and mix until combined, then add the milk and mix to a smooth batter. Pour over the fruit and bake for 30-40 minutes, until just firm in the middle and golden brown. It tastes wonderful served warm – the consistency is somewhere between pancake and custard…. yum! What’s hiding in YOUR freezer? I have blueberries hiding in my freezer too! What a scrumptious recipe for my frozen beauties! I’ll take a look at your Fiesta Friday – thanks! 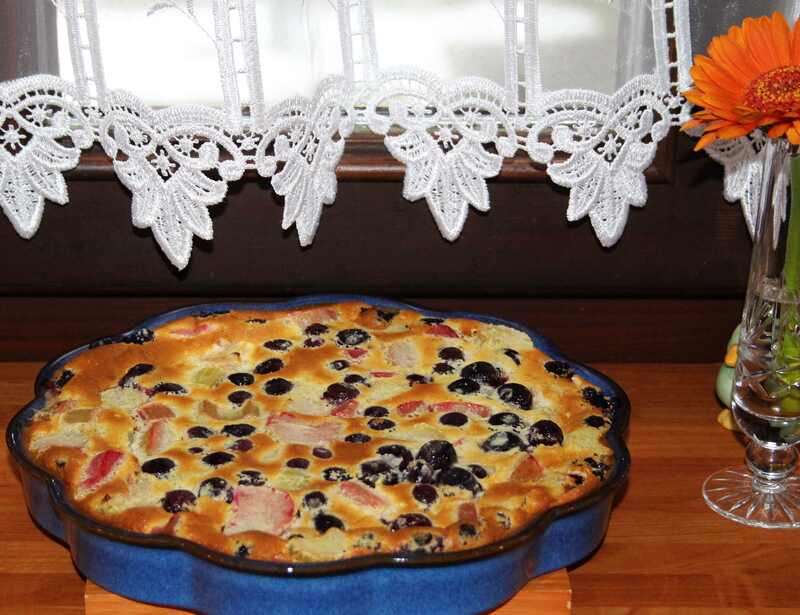 I have some frozen bananas in my freezer, Cathy, but I don’t think they would work in this beautiful clafoutis! No worries. I’ll get some more fruit and I think this looks absolutely wonderful. 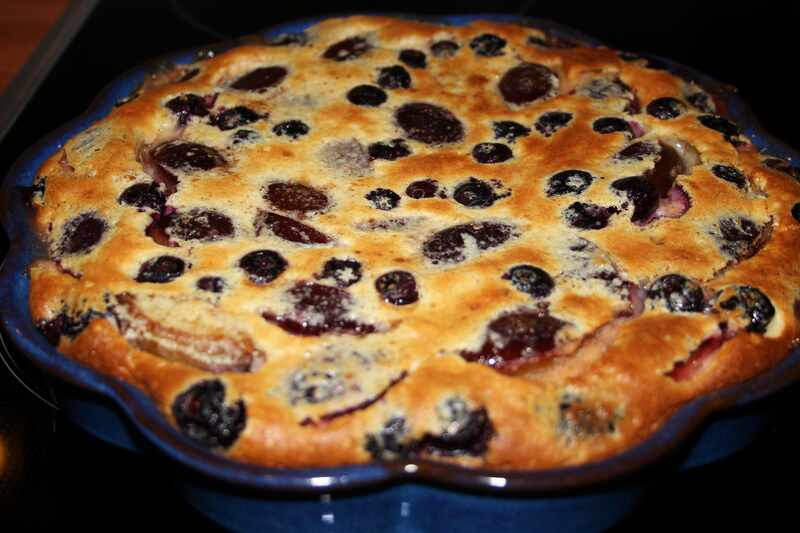 This is a unique recipe for me, and I didn’t even know the word clafoutis. I love this! That looks delicious. I was a bit shocked that you had too many blueberries – just send them over here! They are difficult to find in the shops here and if there are some they are in a tiny container costing a fortune so just to enjoy fresh and raw. I can’t grow them either as I don’t have the right soil. what I do have in the freezer is too many strawberries – any ideas for those would be gratefully received. I tend to hoard blueberries as I panic at the thought of not having any for baking in the winter! I must have had about 20 punnets in the freezer! LOL! I have never tried freezing strawberries as they tend to get eaten or turned into jam before they even see the freezer… I bet they’d be good in a crumble with rhubarb. I haven’t seen any rhubarb in hte shops yet, but it won’t be long now as mine is already sprouting. My rhubarb is also just poking through the soil. I freeze the excess strawberries, then make jam as we need it as it is the one jam that looses its colour very quickly, but there are so many, I think a crumble with rhubarb is a great idea, thank you Cathy. 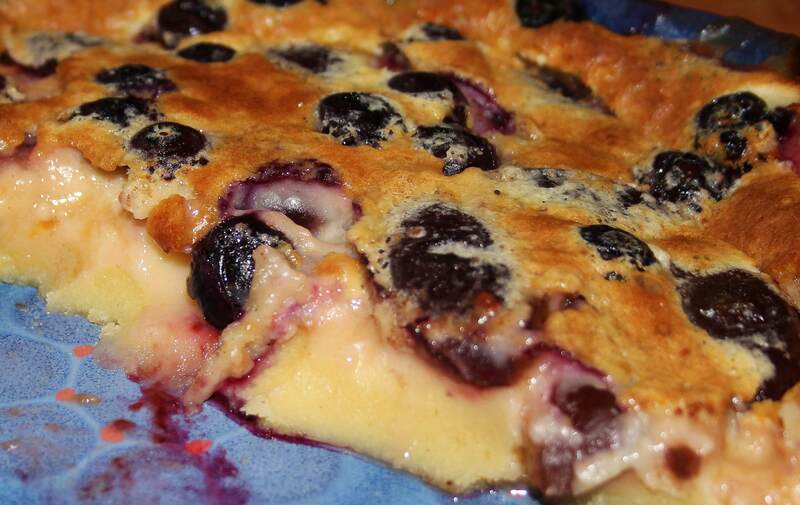 This is my favourite pudding, my mum makes a fantastic clafoutis. How wonderful to have excess blueberries, I have not grown them before but think I will this year. My freezer has an excess of last years gooseberries and raspberries. You are so disciplined Cathy! Our freezer(s) are still full of gooseberries, gooseberries, courgettes & more courgettes &, like others who have replied, I keep finding small packets of peas & beans & spinach hiding under other stuff! I’ve still got quince from two years ago in there! Time for a clear out, I think! If only I had the time to devote to cooking all the stuff up!! I have some rhubarb left…but your clafoutis looks dangerously tempting and shall be tried once I’m off the Nigel Slater orange cake addiction 😉 Enjoy your weekend, Cathy! Oh my! That looks delicious ! I am wondering what fruity goodness might be lurking in my freezer because that looks and sounds delicious. Ooohhh looks lovely! Unfortunately no fruits are hiding in my freezer. I have to wait till they get back in season! That’s a shame – remember to freeze some this year! This is real food. Looked very tasty. No good bakeries here near me. I lived in Europe for three years. I gained 30 pounds. Nothing like the taste of good food. Hi John. You’re right – the bakeries here are very good, but I still prefer homemade! Glad you liked the pudding! What’s hiding in my freezer?! I know there are some strawberries in there somewhere……. And I adore Claffouti, just adore it when still warm from the oven! I love clayfoutis… it’s just so flexible. This looks delish!